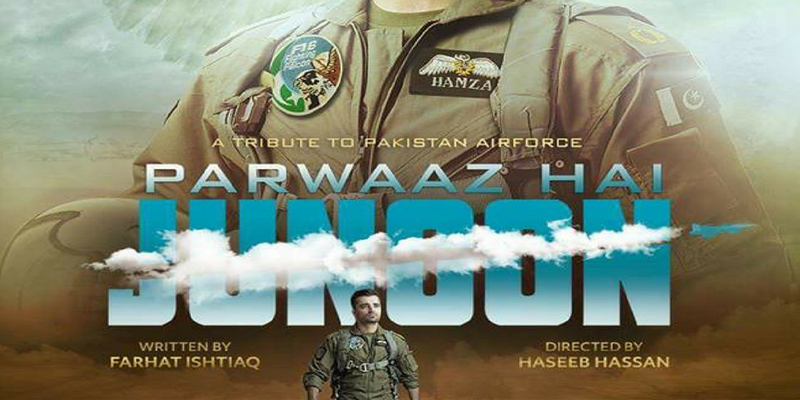 Parwaaz Hai Junoon (lit: Soaring is Passion), a tribute to Pakistan Air Force (PAF), is a feel good story based around the life of it's cadets. The film will take our audiences through the events and experiences that take place at the PAF training academy. With a fresh and young ensemble of actors, this vibrant story focuses on their love of flying, love for our country and the bonding between a group of girls and boys who overcome various challenges to become Pakistan's top notch fighter pilots.The film will showcases a PAF cadet's core values like integrity, honesty, courage, teamwork as well as the everyday comic mistakes and showing the human part of these cadets where they laugh, make jokes, face funny errors and show the lighter side of their daily lives at an Air force academy in Pakistan. Movie released on August 22, 2018. Best Viewed at 1024 x 768 pixels and above. This Page loaded in 0.02494 seconds on Tue, Apr 23, 2019 (20:57).